Inspired by a Pattern for the #31DC2016Weekly - Polish Etc. For this week's prompt for the #31DC2016Weekly, we are all doing manicures inspired by a pattern. There are an infinite number of patterns to chose from. Classic prints, fabric patterns, patterns used in art, patterns seen in nature, modern and ancient architecture...the sources are endless! I was inspired by Damask patterns. These are intricate prints that usually have some floral elements to it. It looks classic and expensive. I chose a bold Damask inspired image from the UberChic 7-03 plate to create this look. I started with an alternating base of silver and black the stamped over that base with the opposing color. The black polish I used was Cult Nails Nevermore and the silver metallic was Sally Hansen Silver Sweep. Both of these were once coaters and stamped beautifully. I think I like the silver stamp over black the best but they are both give a nice effect. I did top this with a glossy top coat. It would have looked amazing with a matte top coat as well. Unfortunately, the matte top coat I used absolutely trashed this mani. So mad. I should do a matte top coat comparison for you all. Would you be interested in something like that? I hope you liked this manicure as much as I did! It's simple but very pretty. 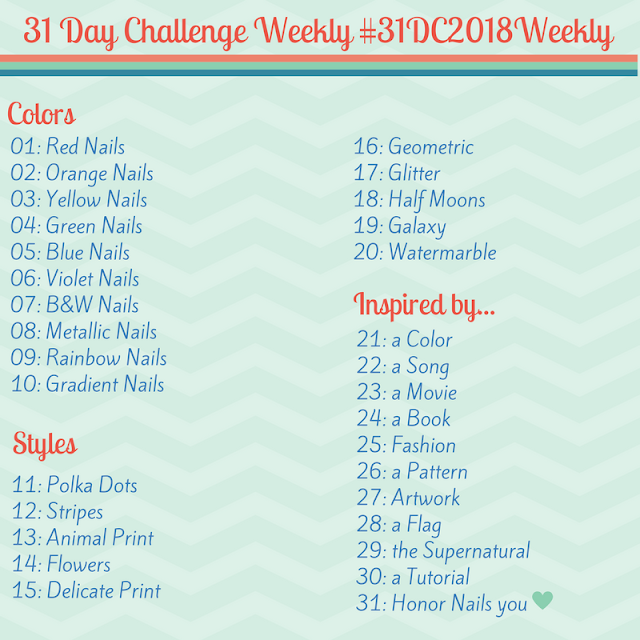 Be sure to check out the other participants doing the weekly challenge using the #31DC2016Weekly tag on Instagram, Twitter and Facebook. Next week, the traditional daily version of this challenge begins. See Sarah's post about the daily challenge here. So you will be seeing tons of people posting about these same nail art themes all month long. My challenge will end on the same day at the daily challenge so we can all celebrate completion together! Yay! I have been thinking of doing a comparison for a while now. I will get one together!